All disease begins in the gut. I can’t tell you how many times I have heard this lately as I read more and more about taking care of my health. Taking a probiotic supplement everyday has become the norm for me and my kids. Today I’m excited to share with you Family Flora Probiotic + Prebiotic because it doesn’t come in pill form, but a powder to easily mix in cold food or drink. Much of our food supply is contaminated with pesticides. Foods are over processed (or unnaturally processed) and things like preservatives change what was once a healthy food to an unnatural, not-so-healthy food. The right probiotics will go to work directly in your intestines to help digest your food and purge wastes from the body. In order to perform these key functions, the gut must be in healthy balance. Good gut health also makes it possible to absorb B vitamins and nutrients from our foods! Prebiotics are a type non-soluble fiber from plants that are essentially “food” for your good gut bacteria. Think of probiotics as “seeds” and prebiotics as the “fertilizer” for them. Without prebiotic fiber in your diet, your gut bacteria will not thrive. 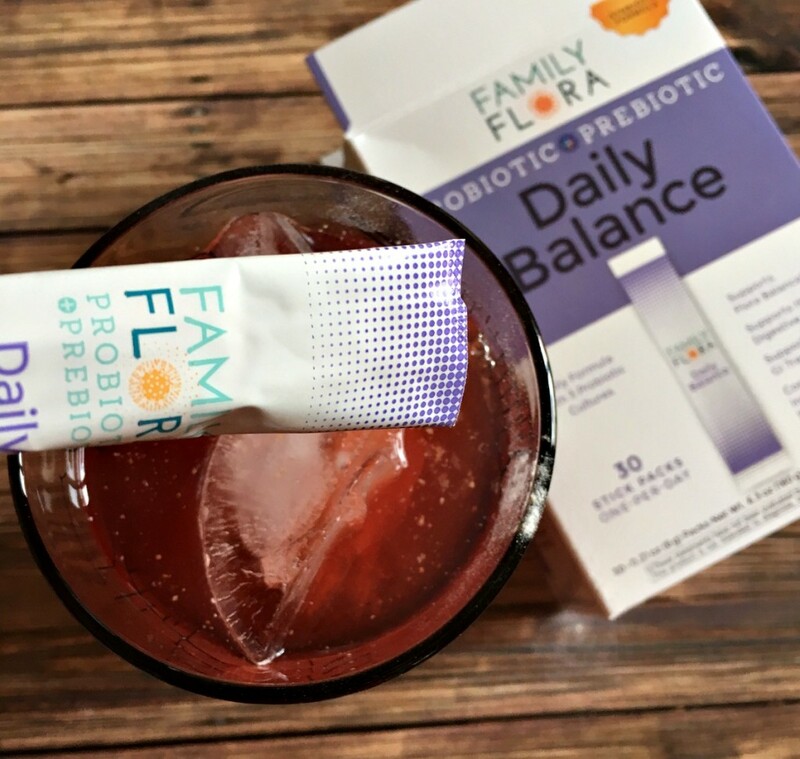 Family Flora is different because it provides both prebiotics + probiotics together in one formula. I hate horse pills. They stick in my throat. I gag. And my kid’s watch me and it scares them a bit! I love the ease of Family Flora. Pour it into your drink or even cold foods like yogurt, applesauce and hummus. Yes there is a kid variety too! With stickers!! They won’t forget to take their probiotic when they get to peel off a sticker each day. P’Diddy loves to place his on our fridge calendar. Keep the children healthy. Probiotics really do help the immune system (my brother will tell you that is why he hasn’t been sick) and there are so many germs at school. 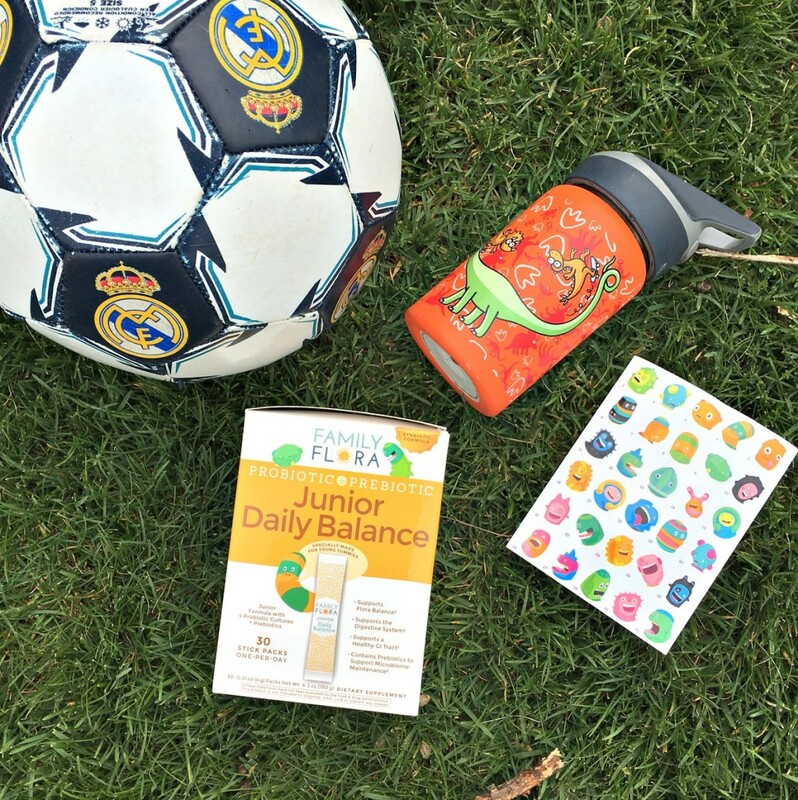 Our favorite place to add Family Flora is their water bottle, which goes everywhere with us. Made in the USA. Non-GMO, kosher, sodium-free, gluten-free and have no artificial flavors or colors. Are you ready to keep your gut healthy every single day? 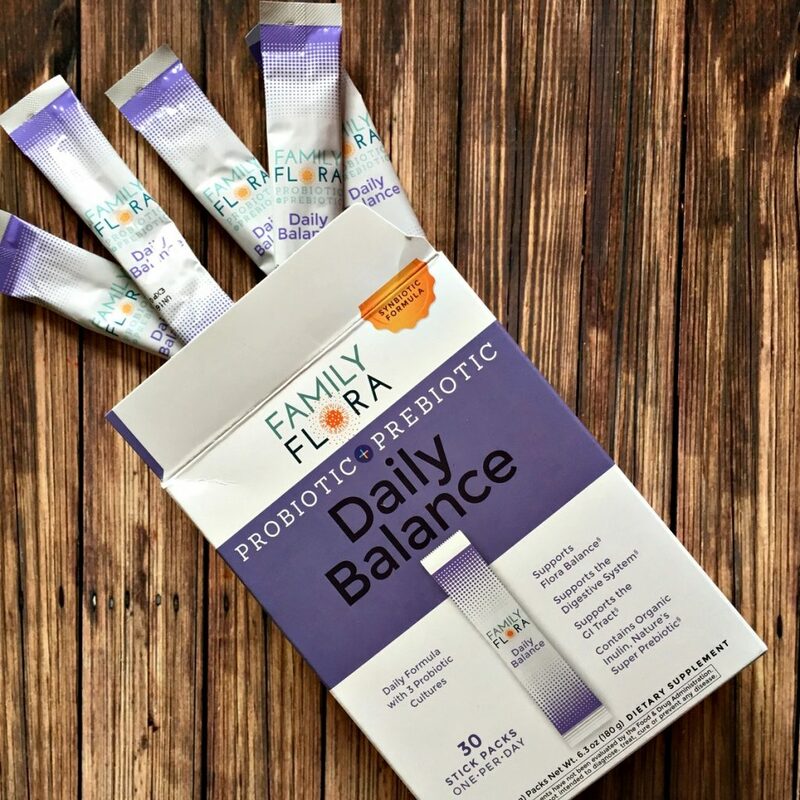 I partnered with Family Flora Probiotic for this sponsored post. All opinions are my own. This giveaway will end on October 5, 2016 at midnight MST. Winners will be drawn via rafflecopter. Once a winner is drawn I will contact them and they will have 48 hours to reply before I draw a new winner. Giveaway is open to anyone in US and you must be 18 years of age or older. Giveaway not affiliated with Facebook & I release them of liability. Winner will be posted in the rafflecopter widget. Yes we do take probiotics and I'm always looking for a better one! We do. I think probiotics, and gut health in general, will be a large part of regular health care in coming years. I haven't been taking one, I need a new one that I am satisfied with. I want to start taking probiotics. I've learned how important this is. I take probotics but not prebotics. My hubby and daughter don't take either. Wish we all took both for improved health. I do! But i'm open to trying new things. I take a probiotic capsule every day, and eat cultured foods, but haven't gotten my husband on board yet. I take probiotics, but haven't found one I like for the kiddos yet. I want to start taking probiotics. Now I know how important this is. We don't currently take probiotics, but I would love to start taking them! We don't take any probiotics but from reviews I think we should start taking them! Thanks for the chance! We don't currently take any, but I often wonder if it would be beneficial! We do not take probiotics, but I want to start to get ready for our first pregnancy! I usually take them along with antibiotics. We have taken probiotics previously but not lately. Would love to get back into taking them. I think I NEED to start doing something.... I'm So messed up lately. Had Lymes and ever since that month of strong antibiotics, something is off. I could use this prize. My doctor just asked me if I take probiotics, since she told me to use them daily. I do take them, and so does my family. I would like to start taking probiotics. I think they really help. I take probiotics daily but they don't seem to be helping as much as they used to. I would like to try another brand. My husband started taking probiotics and I would really like to start too. We have taken probiotics off and on for some time but always in pill form. This one sounds interesting to try and hopefully WIN....smiling. I would like my family to begin taking probiotics. Their health is my number one priority. :-) Thank you. Probiotics may be an added step to my vitamin supplement regiment. Our family was taking probiotics at one point, but we stopped, for some reason. Would love to try these and get our family on the right track again. I take probiotics and I would love to win! WE do not but I would love to try them and see how it may help the family. Yes, I take a Store brand Probotic, but I don't know if it's good or not, has 1 billion active cultures. Thank you kindly for the opportunity! Have a wonderful weekend! I don't, but should be taking probiotics. I've never heard of pre-biotics. I have a lot of digestive issues and these products sound like they'd be ideal for me. Thanks for the chance to try them. I always like to try before I buy. We don't but I would like to try them. My daughter would take them if I do. She's 18. I am going to start my whole family on probiotics this year to help keep us all well! Yes, My family has been taking probiotics for several years. My husband takes probiotics and says they have helped him a great deal. Now it's my turn. I take probiotics when I find them on sale. But I've really been wanting to start my 10 year old daughter on them. She has real problems with her tummy and these may be a great start! I want to take probiotics. I've been reading so much about the health benefits. I do take probiotics once in a while. We don't currently take them (unless they are in my greens, but I don't even drink those regularly), but I would love to start taking them! I take them and my 10 y.o. is using them somewhat regularly as well. I don't want to start. I need to start. LOL Oh the joys of getting older. I do take them but my husband doesn't. I see a difference in my body. They help. No we don't but we do eat a lot of yogurt! We don't take any currently. We probably should be though! I would love to start. Yes I do take probiotics to keep digestive system healthy. I do try to take probiotics, but I also have a hard time swallowing pills so I sometimes forget to take them or repurchase them as often as I would like to. Family Flora seems like a really good brand and I love that it is in a powdered form that can be mixed into various drinks and food. Our family would like to start taking probiotics. My family and I want to start taking Probiotics. I want to start taking probiotics. I want to win. I've heard great things. I want to start! We have taken the probiotic yogurt before. MY Family takes probiotics every day. I love the benefits of taking them! We have not but we would be interested in it. We do not take them but I would love to start! We do take probiotics and they have really made a difference. I would love to give these a try. I currently take probiotics in pill form but would love to try the drink! I have not taken probiotics but have been thinking about starting. "Want to start" bleachers, so let's try these. Yes, my family and I take probiotics. Given that fact, it would be great if I could win the family flora probiotics you are giving away. My family members and I would definitely use them. Thanks for the fantastic opportunity to win!